In today’s world smart phones have become a vital part of our lives, as the technology increasing rapidly. Mobiles made it easy to access Internet and to browse WebPages at every corner, at our homes and workplace. This made web designers to code separately for mobile devices. Already some websites like facebook, twitter and orkut have both web version and Mobile version. Mobile version makes mobile viewers to browse in more flexible way. Now it’s Blogger’s turn. It has launched Mobile Templates. By the help of Mobile Template, we can make our blog to look great on mobile devices with a mobile-optimized version of our current blog template, hosted on Blogger. 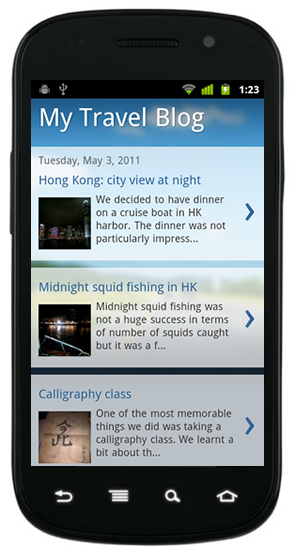 Mobile Templates serves Blogger blogs to load fast and fully on small screen of smart phone. 1. Go to the Dashboard -->> Settings -->> Email & Mobile tab. 2. Enable the mobile template option. Here you can also preview your blog before using the mobile version. It makes your blog smartphone-friendly. Mobile version will be displayed by automatic redirection when your blog accessed from smartphones. Presently, all 27 Designer Templates are supporting and some gadgets. For non designer and customized Template blogs default generic template version will be displayed. Mobile ads also displayed at the top of the post pages and at the bottom of the index page if the blog has an Adsense gadget or in-line blog ads.